Hor-Aha: First King of the First Dynasty, his name means 'Fighting Hawk'. His Nebti name 'Men' appear side by side on ivory labels. First King of the First Dynasty, his name means 'Fighting Hawk'. His Nebti name 'Men' appear side by side on ivory labels. Founded a temple to the Goddess Neith at Sais in the Delta. Founder of the capital city at Memphis. He reigned according to Manetho for 62 years. His tomb at Abydos (B 19-15) is the largest in the north-western section of the cemetery. Thought by many as being identical with king Menes, named in later sources as the founder of Egypt. Hor-Aha succeeded Narmer as ruler of both Upper and Lower Egypt, so it is assumed that Narmer was his father. Hor-Aha continued the process of unifying Egypt into a single kingdom. Military expeditions against the Nubians in the south, spread his rule as far as the first cataract of the Nile. Berenid was his queen, and his mother was probably Neithotpe. Aha's son and heir, Djer, was born to a lesser ranked wife, Hent. Two legends grew in later eras about Aha. One was that he was killed by a hippopotamus, the other that he was attacked by wild dogs and saved by a crocodile in the Faiyum. He is credited with founding the city of Crocodilopolis as a result. More recently a joint American excavation from Yale University, the Pennsylvania University Museum and New York University, found a chamber used for burial rituals and found a cache of 200 rough ceramic beer and wine jars. The mortuary enclosure of King Hor-Aha, also included a cultic chapel. The enclosure in believed to be where the body of King Hor-Aha was kept during burial rituals. The enclosure also included three rectangular tombs with wooden ceilings covered with reed matting. 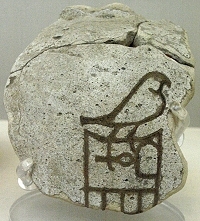 The enclosure also had a chamber of pots with hieroglyphs indicating they were made during the reign of Hor-Aha.